may be treated with topical or oral antibiotics. While not usually serious, it is possible for bacterial skin infections to progress deeper into the tissues or into the blood stream. Eczema (atopic dermatitis) is a chronic skin sensitivity that usually first manifests in childhood. Individuals are predisposed to having very dry skin, and flares of itchy, red rash. Read more about eczema here. Allergic contact dermatitis occurs when an individual’s immune system becomes sensitized to a chemical after it comes into contact with the skin. There is a multitude potential allergens in our environment; some common ones include fragrances, dyes, preservatives, cosmetics, soaps, latex, metals, poison oak and various other botanicals. Symptoms can range from mild irritation or itching to severe red rash with blistering and weeping of the skin. 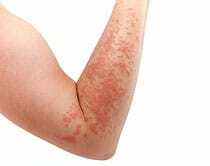 Read more about allergic contact dermatitis here. It can be difficult to differentiate between the types of allergic reactions in the skin, and overlapping conditions do occur. If you feel you may be suffering from skin allergies we will be able to recommend the appropriate testing and treatment for what is ailing you. In addition to a thorough history and examination, it may be useful to perform a scalp biopsy, examine the hair under a microscope, or order blood tests to pinpoint the cause of alopecia. After a diagnosis is made, treatment options include topical or oral medications, corticosteroid injections, immunotherapy, and light therapy.